Using kindness as driver in business, is a proactive approach aimed at enhancing the health and sustainability of the people within our organizations. The influence of a leader in creating this positive and sustainable culture cannot be underestimated. So lets be even clearer, leadership is earned. Leadership is not the right of being born into the role because of tenure or being in the right place at the right time or even less getting a position because of whom one knows. It is not for the person who looks about the room, points the finger when all isn’t going well and says “Why don’t they fix this problem?” Rather, it’s someone who steps up to the plate to fix the problem without being directed. We are each responsible and capable of developing our own leadership skills and talents, thereby making ourselves accountable for managing our own careers. Our organizations are hungry for individuals who are self-directed, personal growth–oriented, with a propensity toward lifelong learning. In my experience, these are the individuals who succeed at all levels, regardless of the position or pay grade they hold. It is true that there is no security in any job — it’s in the person who holds the job. English historian James A. Froude suggests to us that we cannot dream ourselves into a character; but instead we must be willing to hammer and forge ourselves into it. So what character traits help us to create a kinder workplace? Over the next two newsletters I will touch on each of the twelve traits everyone is capable of cultivating. As an authentic person you are genuine and cultivate awareness of your own behaviors, knowing what you value and living life on purpose. You are not embarrassed to show your humanness toward others. You are consistently genuine and true to yourself, and others feel safe and comfortable in your presence. Cultivate awareness of what is most important to you and allow others to see your true self. When you see someone with a great attitude, you know it. It’s in all they do, from being consistently positive to exuding enthusiasm in their actions and words. People with great attitudes approach life as a classroom, with curiosity and humor. They cultivate a belief that they control their life and that they choose their response to their surroundings. Develop an ability to look for the positive lessons in your daily challenges by deciding that you are responsible for choosing your attitude. As a resilient person you have strong reserves of inner and outer strength. You are consistently conscious of seeking new ways to build strong personal foundations so you may weather the storms of life and work. Through increasing your awareness of how to care for yourself mentally, emotionally, physically and spiritually, you are able to feel more balanced, accepting change as a natural course of life. Practice a proactive approach to creating a healthy and vibrant lifestyle by examining your own behaviors in response to challenging events. Excellence is having a firm commitment to grow your potential through being committed to life-long learning. You believe in stretching and challenging yourself by giving 100 percent of your best in everything you do. Taking pride in your endeavors both in work and life you recognize that no accomplishment is insignificant but rather a contribution to the whole. Choose to show up, be present and give 100 percent of your best self to everything you do. You are someone in whom others can confide; they know you will listen without judgment. You are firm, friendly and fair and act with the highest of integrity by always giving credit to those who deserve it. You always strive to be honest, to tell the truth with consideration for the feelings of others. You are known to be reliable and to keep your word. Speak your truth with honesty and integrity by demonstrating you are as good as your word. You are a confident person who offers support without thought of your own needs being met first. Compassion is not about learning to say the perfect things at the perfect time, but rather about showing consideration for others’ pain through listening and caring. You see it in a warm, safe smile, a nonjudgmental look of encouragement, a kind touch, or anything that will lift another person to a place of higher confidence. Practice being nonjudgmental by reaching out to those around you and connecting with empathy. Authenticity, Attitude, Resilience, Excellence, Trust, Compassion. Courage, Friendship, Service, Responsibility, Integrity, Tolerance. Seed by seed we plant a flower garden, grain by grain we create a healthy baked loaf of bread, and with brick & mortar we build magnificent stone cathedrals and homes. I will dare to add that it can also change destiny, and our conscious actions control how the paths will lay out. This gives me great hope for our organizations both small and large — knowing that positive change can occur, that it lies within our grasp. As our organizations mature both intellectually and emotionally, we begin to realize that it is not the techniques or tactics of change we require, but a change of heart in how we do business. It requires connection, compassion and community encompassed within the corporate vision and simple concepts that when applied, can influence a culture for a greater common good. Courageous people believe in doing the right thing for the right reasons even in the face of obstacles and adversity. You don’t allow fear to paralyze you from moving ahead and you consistently take small steps forward to complete your goals. With the spirit of tenacity, as a courageous person you take risks in order to grow and strengthen your character. Develop the internal resolve to make a change in your life and do what is right even in the face of personal adversity. A friend is someone with whom you can talk freely, in an open and authentic manner. A friend accepts you without judgment, tells you when you are off base and warmly brings you back to earth with their profound bluntness. Friends give you a sense of belonging and help pull you through during the day-to-day challenges of work and life. Provide a safe and supportive environment full of goodwill and respect for one another. When we are in the spirit of service, our intention is to contribute outside of ourselves. Service is about looking around you each day and realizing it’s the small acts of service that surround you that make the difference. No act of kindness is too small to make an impact. Make a difference in others’ lives through giving of one’s self altruistically. Being responsible is a choice we make daily in all our actions and decisions. We are accountable for how we treat others. We know we have the ability to impact and influence those around us, and we always strive to set a positive example for others. We know that everyone on the team is accountable to the group. When it’s one person’s problem, it’s everyone’s. Identify where you have the power to influence, and accept responsibility for leading positive change. You know you have integrity when you walk our talk and those who know you can depend on your words and actions. Integrity is taking a stand for what is right and being honest in all your dealings. Our workplaces and neighborhoods are made up of a diverse mixture of multicultural, multigenerational and multidimensional people with different beliefs, wants and needs. Each person and business has a story to tell of struggles and triumphs that need to be shared openly. By opening up you welcome others into your circle of friendship, you break down the barriers that cause fear and hurt. I wrote The Business of Kindness, for the leader in all of us, regardless of what our job description reads. As John Quincy Adams reminds us, “if your actions inspire others to dream more, learn more, do more and become more, you are a leader.” More now than ever we need champions with the will and courage to change the workplace, one person and one kind act at a time. 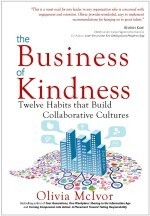 So how about taking the kindness in business challenge? When was the last time you committed a random act of kindness for yourself, your colleagues or your community? I warmly challenge you to in the next 48 hours to stand up for an ideal and send forth a tiny ripple of hope. Commit an act of kindness and participate in transforming the world of work, as we know it today. We live, we learn, we laugh.